23rd United States Colored Troops. On November 19, 2011, I drove to Gettysburg to participate in my first Remembrance Day activities. Gettysburg has been my favorite Civil War battlefield since my first visit as an eight-year-old kid! Every time I visit, it is a special day for me and I see something that I have not seen before. The memories of my first visit always come back to me as soon as I get on Steinwehr Avenue. So, to go back there to actually participate in the parade and other Remembrance Day activities made this a very important day in my life. The remembrance of my first visit to Gettysburg is still truly awe-inspiring to me, as it was my second visit to a Civil War battlefield. The first was to Fredericksburg; standing on top of Marye’s Heights was stunning to this little boy in 1958 and impressive with its few monuments in the national cemetery. When visiting Gettysburg with its more than 1,400 monuments and its many Civil War museums, I was fascinated and wanted to know everything about this magical place. I loved the electric map, the Cyclorama, and seeing all of the muskets in the glass cases in the Gettysburg Battlefield Visitor Center. Out on the grounds, with the park historians and guides explaining the fighting at Cemetery Hill, Culp’s Hill, Devils Den, Little Round Top, and Pickett’s Charge, I felt like I was back in 1863 and actually witnessed the fighting. Every time that I visited Gettysburg afterward, I always looked for something that I had not seen before or I would follow in the footsteps of Generals Buford, Hancock, Warren, Longstreet, Armistead, or Lee or Colonel Joshua Chamberlain. I visited the monuments, then went home and looked up the names of the soldiers or the regiments, brigades, or corps – whose names were on these monuments. The Iron brigade became my favorite brigade because of what they did on the battlefield at Gettysburg. I have often read about the fight between the 24th Michigan Infantry and the 26th North Carolina Infantry on McPherson’s Ridge. And now, here I was, 51 years after my first visit, dressed in the uniform of a corporal in the 23rd United States Colored Troops portraying a Union soldier on this most hallowed ground! Walking around on Steinwehr Avenue on this chilly Saturday, I was thinking what it was like to be here as a Union soldier on July 1st in 1863. On the morning of July 1st, would I be out in the vicinity of Cashtown Road with the I Corps or would I be north of the city with the XI Corps of the Army of the Potomac? Either way, I would be in a fierce fight with the Confederates of the Army of Northern Virginia. In the afternoon, I would be running toward Cemetery Hill until General Winfield Scott Hancock organized us either on Cemetery Hill or Culp’s Hill. I wondered how I would fare in that fight. Would I have stood strongly like the Iron Brigade of the I Corps or run like the XI Corps? I was glad that I was here in 2011 instead of 1863. The first program was the Dedication Day Program in the Gettysburg National Cemetery, and I had my picture taken with President Abraham Lincoln before he gave the Gettysburg Address. There were military bands playing before and during the ceremony. I heard Stephen Lang, the keynote speaker, give his speech, and I thought about seeing him in the movies Gods and Generals and Gettysburg, or hearing him on the audiobooks reading Gods and Generals and The Last Full Measure. He enjoyed his roles in the movies and his time spent in Gettysburg. The next program was the United States Colored Troops Graveside Salute. This presentation honored the two USCT buried in the Gettysburg National Cemetery. The 23rd USCT, along with our friends in the 54th Massachusetts Infantry, as well as members of the 3rd USCT, 6th USCT, 22nd USCT—USCT representing Camp William Penn—all were part of the color guard for this event. The keynote speaker for this program was Harriet Tubman as portrayed by Millicent Sparks. I must say that Ms. Sparks was magnificent as Harriet Tubman, in appearance, manner, and in speaking. Kevin Williams, a fellow 23rd member, and I remarked how inspirational it was to be in line and hear Harriet Tubman praise the USCT and how proud the African-Americans in the crowd must have been as they heard her speak. The parade was the biggest event! As we were getting in line, I saw several reenactors that I had met during my time at Fredericksburg. I had a couple of conversations with General U. S. Grant and his wife Julia. He then came over to say hello to me as he reviewed the Union troops. I guess some of my fellow soldiers were a little jealous that I had friends in such high places! I was surprised as we walked past the many Confederate troops and amazed as we walked past thousands of Union troops. This was the first time I had seen more Union troops than Confederate at any one reenactment. Once in line (our unit was in front of General George Armstrong Custer), the music started to play and we started to march. When you hear the music and began to march, you start to feel that you are no longer in 2011 but you are transported back to 1863. There were so many people cheering that I was surprised that I heard my friend and NPS colleague Beth Parnicza call my name. I was trying to turn to see her, but there were just too many people there for me to quickly find her. I heard that our unit was impressive, as Lieutenant Jimmy Price commanded “eyes right” as a salute to each group of generals that we passed. We also heard someone shout out “Spotsylvania” as we passed; we had a banner with our name on it and Spotsylvania, VA underneath our name. Our abolitionist senator James Anderson carried our banner and Captain John Cummings was at the opposite end of the line from Lt. Price, with Kevin and I in the middle. The parade was thrilling, and so many people came up to us thanking us for keeping the history of the Civil War soldiers alive. They were very respectful and friendly with their thank you’s to all of the soldiers, Confederate and Union. Kevin and I had one more event to participate in, the Lincoln Cemetery event. This is a black cemetery founded in 1867 by the Sons of Goodwill Society, an African-American organization that included veterans of the United States Colored Troops. USCT soldiers were denied burial in the Soldiers National Cemetery at Gettysburg because of segregation, so 30 colored soldiers are buried here. The two colored soldiers who are buried at the National Cemetery were re-interred at that cemetery years after the Civil War. Most of the black Civil War living historians stayed for this ceremony, and we were recognized and thanked during the program. This was a sobering program because of the history of our country that denied these soldiers a proper burial in the national cemetery. However, they are remembered on Remembrance Day every year. Once again, Kevin and I talked about how proud we were to be a part of this ceremony. Now it was time for me to leave Gettysburg. Whenever I leave this battlefield, I am sad to be going away. There is always more that I want to see and do. On this day, it was with tremendous pride that I saw how many Americans were on hand to commemorate the veterans of the Civil War, who fought, died, and are buried here. There was no more animosity to one side or the other, just the joy in celebrating a dark period in our history that made the United States plural into the country that the United States is today. American citizens have come a long way in 150 years, to make all Americans cordial and respectful to each other. That respectability showed all day long on Remembrance Day. 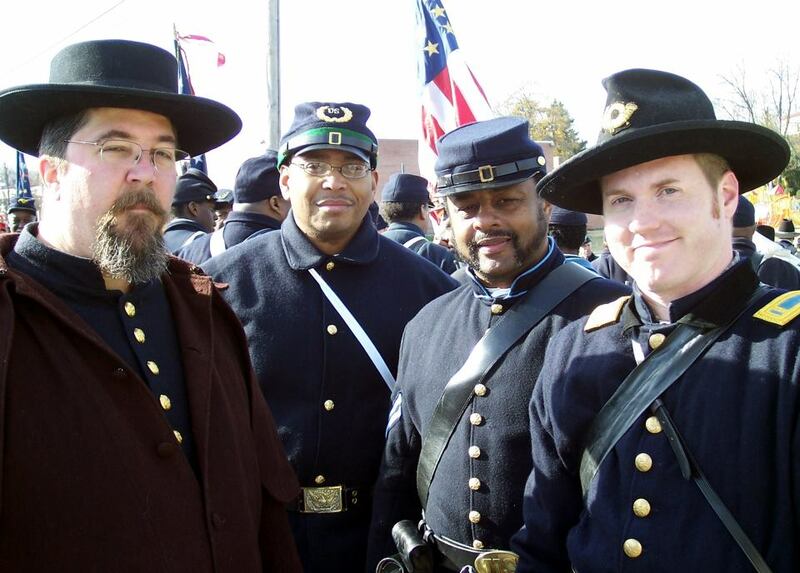 I was very proud to play a small part in the glorious recognition and meaning of the Gettysburg Remembrance Day. 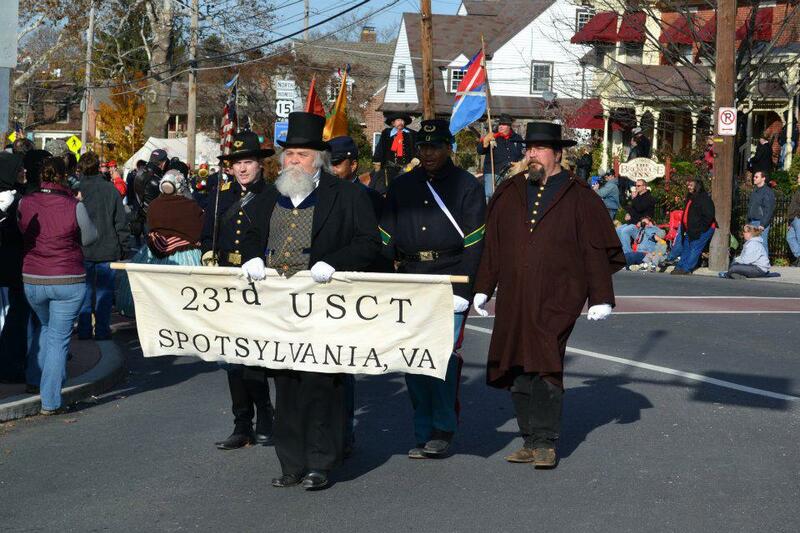 Follow the 23rd USCT on Facebook. This entry was posted in Battlefields & Historic Places, Civil War Events, Common Soldier, Preservation, USCT and tagged 22nd USCT, 23rd USCT, 3rd USCT, 54th Massachusetts, 6th USCT, Camp William Penn, Gettysburg, Lincoln Cemetery, Remembrance Day, Steinwehr Ave, USCT. Bookmark the permalink. I swear I am just gonna move there someday! In reading of first memories I remember my first trip there with the family in 1958. I was a H.S. student and have been enamored with the Battlefield ever since. I have probably toured the fields a minimum of 75 times. My first recollection was climbing the tower on Big Round Top and being able to see the whole field. The guide was a bit winded when we got to the top. I wish the restoration project was done then so we could have the vistas we have today. Thank you for sharing this account of your visit and your insights. Your words do much to explain why Gettysburg remains relevant to Americans today.